Nintendo does not have much of a history in the world of Downloadable Content (known here on out as DLC). In fact, it was only a few years ago that Nintendo began offering any DLC at all. It is even more recently that Nintendo has offered the less-preferred kind of DLC known as 'Paid DLC'. There are gamers who are hesitant to spend extra money on titles they have already purchased. This I would think is a rather natural reaction. You really need to prove to your audience that the bonus content is worth their time and money. There's a saying, "Go Big or Go Home"… and I can proudly proclaim that with New Super Luigi U, Nintendo has gone big. 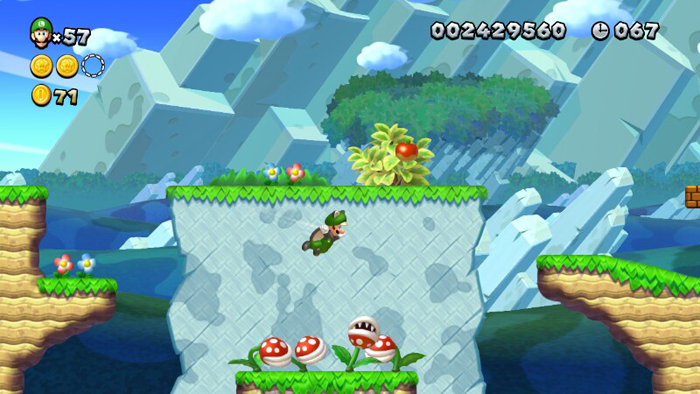 Now do not get me wrong, the level packs within New Super Mario Bros. 2 were a nice addition. You had your main game which was packed full as expected and additional Coin Rush level packs could be purchased. I never was very into that kind of extra content and thus it felt unnecessary for me. New Super Luigi U goes beyond the call. Out now, New Super Luigi U sells for $19.99 on the Nintendo eShop and it requires the purchaser to own New Super Mario Bros. U first. The two games share the same world map and other assets and the DLC is added to this. So when you want to play New Super Luigi U, you will need to pop in your copy of NSMBU first. In August there will be a retail version of the game to be sold at $29.99. It is an interesting move which had this reviewer torn. I wanted to wait for the boxed version so that I would have the game self-contained. Still, the idea that I could get 82 new mario-style levels right now was all too enticing to hold off on. Upon first boot I found that the cutscenes and story have been slightly altered so that Luigi's bloated-brother was but a memory. In fact, when wanting to play some 4-player multi-player you will find him replaced with Nabbit, the rabbit-thief from the original game. I will mention more on the multiplayer later. The game will feel very familiar at first. You will hear the same music, see the same overworld, and enjoy the same control-scheme you already know and love. However, the moment you jump into World 1-1 you will find that you are not in Kansas anymore. All the levels in this game are remixed. They are not just simple placement swaps though… every level is re-crafted for a new purpose… Luigi play. You will find that the levels are much more difficult. This is done through a few means. First you play as Luigi. He's going to be much more slippery than Mario and have more inertia to overcome from a standstill. The Mario series has always been known for precision platforming and so it takes some getting used to here, even if you have played as Luigi in past titles. The levels are also much shorter than normal. Do not get me wrong, they still each contain three Star Coins to collect and discover. The reason shorter levels equals more challenging gameplay is because each level only provides you 100 seconds to complete. The moment a level begins you hear that taunting tone which signifies "Dude, you're almost out of time!" There was one level in the final world that actually has rising lava as well. I found myself racing the clock and the lava and it was over before I knew it. I had no idea how I beat it on the first try as I had many close calls but I just speed-ran through it due to my nervousness and when it was all over I was shocked. As I made my way through the worlds I found that despite the constant adrenalin rush and perpetual motion the game forces me into, there was something redeeming going on… the level design. While the worlds all have their level-circles all in the same place, the levels themselves were constantly unique and engaging. Some were incredibly hard and some were over really quickly. It felt like a mixed bag despite everything having that wonderful Nintendo design and polish. It was not until I made my way into the second-to-last world, the Meringue Clouds, that I seemed to really 'get it' in terms of level design. My original concerns kind of dissipated. Maybe it was because of the time I had spent with the game in general but by then I saw charming new ideas like the Three-Headed Block Snake and I just fully appreciated the game. I saw the value this title holds. The game is a good game well before this point but it took a while for it to become a great game. Much like Luigi's slow start while running, the game had that inertia to overcome with me. When I finally got going, I lost the weird feeling I originally had inside me. Luigi really makes a name for himself and I would love to see a future with more fleshed out levels/concepts based on Luigi. When I would go back to find coins I had missed or secret exits I knew were there somewhere… It was so gratifying to discover them and/or succeed in pulling off the tense maneuvers necessary to achieve my goals. I do have to say this about the very last level… so please avert your eyes if you do not want to hear about it. Skip to the final paragraph after the next photo. 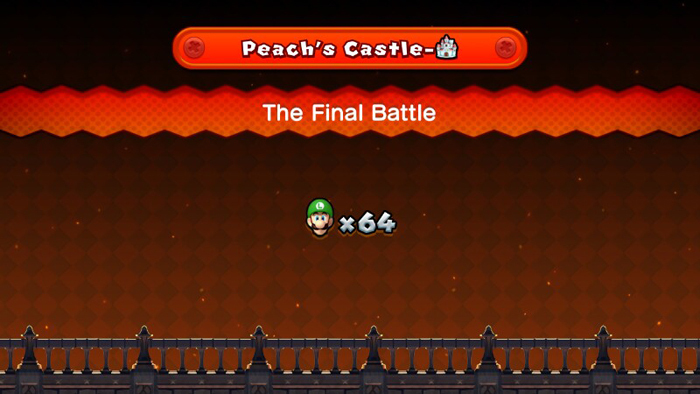 The ending is very similar to the end battle in the Mario variety of this game but I will tell you this… Luigi's physics make it indeed one of the hardest levels ever in Mario Bros history. It was the only level so hard that I was screaming obscenities aloud. 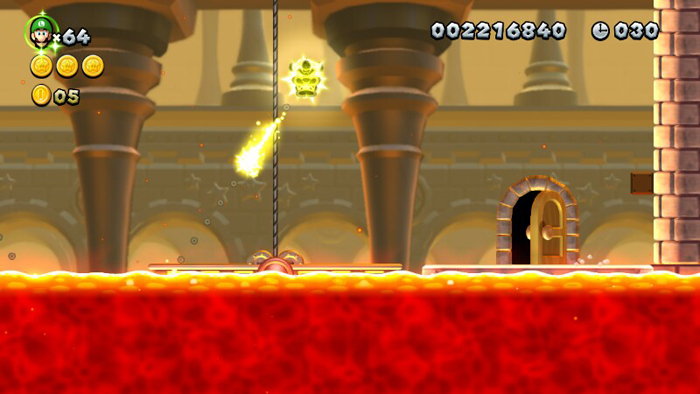 Baby Bowser continues to get in your way and there is a ton of lava to fall into. It is tough but with persistence it can be completed. I died a lot and that led me to discover that after a certain amount of deaths, you are forced to change into Nabbit. This is the game's version of the help block I suppose. I chose to die instantly and then back out so I could play through another level and reset this stupid design. I should not be forced into help mode. Nintendo should know better than that. In the end I was able to learn the intricacies of the final level and I could probably beat it much easier now. Just that initial shock of the level discovery is more challenging than many other levels I have ever encountered. It felt great to complete it though. Beating the game does unlock a unique bonus which I will not detail here. I am actually really pleased with this bonus but I probably will not attempt to utilize it until I have fully found all coins and found ever exit. Where's Gob Bluth when you need him? In conclusion, the assets are the same… the music is the same… the map is the same… but those end up being quite minor flaws in the end. Frankly this might even feel down right weird to you at first. I assure you though the feeling passes. The price is right and the value is substantial enough to warrant it. You get an often neglected character getting his moment to shine with his own special physics. These physics change up the gameplay, adds tension, and provides a refreshing-newness to an aging title. It will be a smart buy for those Wii U owners looking to extend their purchase from the past eight or so months, but it will also be smart for anyone buying their first Wii U and Mario game in the distant future. Lets hope Luigi gets to show off his brave side a bit more in the future. \Frankly this might even feel down right weird to you at first. Like I said in that other thread, this game is what came out instead of NSMBU in some alternate universe where a minor decision at Nintendo butterfly-effected into this. That's a funny way to look at it. I'm sure that's true somewhere. I wonder what New Super Peach U plays like. Having completed the game 100% (*spoiler* I loved this final section of the TRUE last level *spoiler* ), I can say I had an awesome time with this game and I loved how Nintendo implemented it as DLC for the Mario game. Level design is simply astounding, and using Luigi's floaty jump and slippery physics made for some intensely challenging moments. It was not until I made my way into the second-to-last world, the Meringue Clouds, that I seemed to really 'get it' in terms of level design. My original concerns kind of dissipated. Maybe it was because of the time I had spent with the game in general but by then I saw charming new ideas like the Three-Headed Block Snake and I just fully appreciated the game. I saw the value this title holds. The game is a good game well before this point but it took a while for it to become a great game. I felt the levels really started picking up early on in the game in terms of creativity, but it's true that the later levels really shine with their brilliance. I read your paragraph about the last level in the game (where Bowser Jr. is constantly slamming into the ground and/ or you with such speed and confusing patterns); my, oh my, that was frustrating indeed! I had no idea the game forced you to play as Nabbit if you are dying too much. The timer was never really an issue to bring down my enjoyment of the game, to be honest. The levels are short enough and fit well with the time limit. If I have any quibble about this game, it's the same as some of the other titles in the 'New' series: some of the secret exits and hidden Star Coins are almost impossible to find without a guide. It seems some of them are just randomly hidden behind some wall; like, how would you ever guess to ground pound in that one location??? In the end: Loved playing this game. Even though some may claim Mario releases are becoming all too frequent, I say: bring them on. I simply can't get enough. 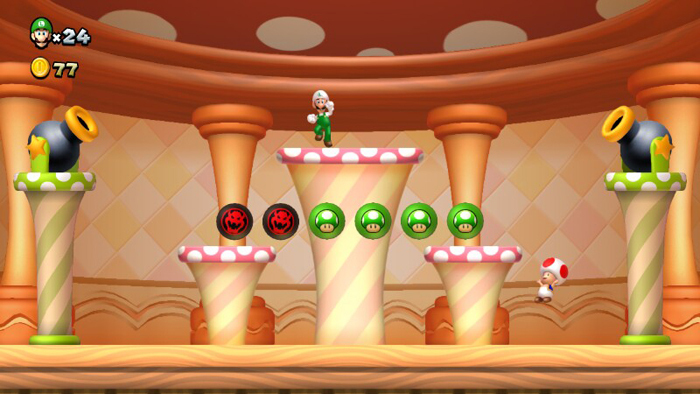 One of the small touches to the game that wasn't mentioned in the review is the fun of finding a hidden Luigi image in every stage. I smiled when I risked my life getting to this one area thinking there'd be a Star Coin. Good stuff! I just 100%ed this moments ago. Really great stuff and when you combine it with the original game, I think you've got an argument for the best 2D Mario ever (although I'd still give it to Super Mario World). I did the same exact thing! I was not amused. She has to rescue Anita Sarkeesian. Indeed, this is one stellar bit of DLC. Keep it up, Nintendo. Nintendo does not have much of a history in the world of Downloadable Content (known here on out as DLC). In fact, it was only a few years ago that Nintendo began offering any DLC at all. Eh. I think Nintendo DLC started around the same time as the other companies in the industry did, which was early last gen. Lots of their games over the course of the generation have had DLC, tbh. The concept of "paid" DLC is relatively new, though. I couldn't find peoof past a few years ago. Prove me wrong and I'll happily amend my review. I want it to be as accurate as possible. I may be mistaken, but the first bit of DLC from Nintendo that I can remember was in 2005; Animal Crossing: Wild World had DLC. The Super Mario furniture items were only available via DLC. And although I'm not certain it was only available via DLC, I got the The Legend of Zelda's Master Sword from Nintendo by downloading it. I know that in 2006, Nintendo released Mario vs Donkey Kong 2: March of the Minis which featured downloadable stages from the internet. Also, back in 2007, Nintendo released Pokémon Diamond/Pearl on Nintendo DS, and that featured DLC in the form of exclusive monsters only available via Wi-Fi. Professor Layton and the Curious Village, also released in 2007, had DLC in the form of new puzzles that could be downloaded. I'm not sure if this counts since it wasn't officially released in North America, but Jam With The Band had a TON of DLC, too. Ha ha, yeah good point. They kind of were! I was going to play this game last night but, the Wii U won't read any discs. I'm gonna have to send it in.